Our friends at Journey Latin America jst shared this interesting and very usefull information with us. ... take a photo of that lovely smiling cholita? Is she looking at your camera lens? Should you pay for taking her picture? How much? Don’t actually want to pay? Don’t even want them looking at the camera for your picture anyway? 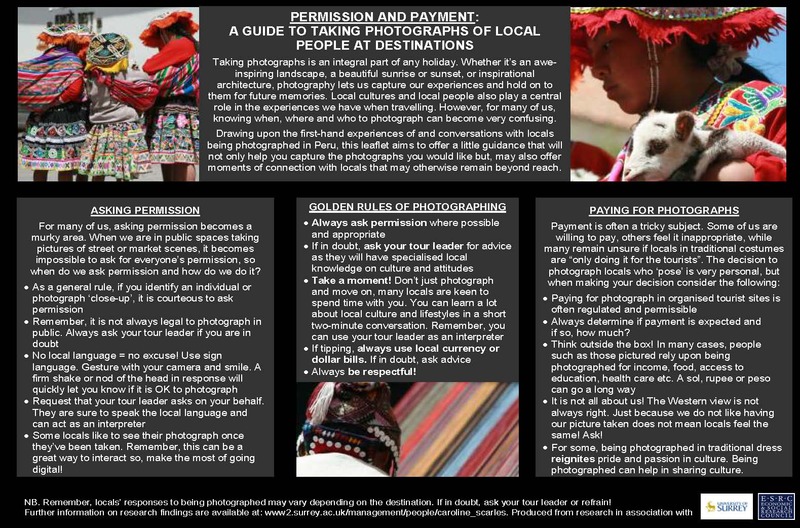 The University of Surrey has recently done a study on the impact of tourist photography on developing destinations, using Cusco as a case study. You can read the full paper from our intranet, or if you want a quick summary of the findings, there’s a 1 page guide, which we’ve also uploaded to our website for clients to find, and will be referenced in the briefing dossier when next updated.